Iron-on patches with shapes of dogs and cats mainly, especially with designs oriented to children. You can also include other less common pets, such as bunnies, monkeys, chameleons and even monsters. Another product that can be found in this section are the stickers to mark clothes with pet motifs. 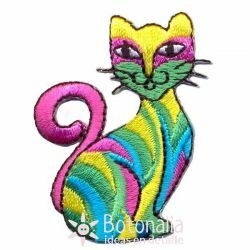 Product Description: Sticker (patch) with an embroidery of a colorful cat.Content: 1 iron-on stickers.Dimensions: 53x35 mm.Material: Textile. 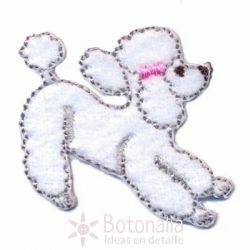 Product Description: Iron-on sticker (patch) with an embroidery of a small dog.Content: 1 iron-on sticker.Dimensions: 35 x 35 mm. Max. length: 45 mm.Material: textile. Product Description: Iron-on sticker (patch) with an embroidery of a small cat.Content: 1 iron-on sticker.Dimensions: 25 x 35 mm. Max. length: 41 mm.Material: textile. Product Description: Iron-on sticker (patch) with an embroidery of a kitty in blue with a ribbon in pink.Content: 1 iron-on sticker.Dimensions: 28 x 30 mm. Max. length: 33 mm.Material: textile. 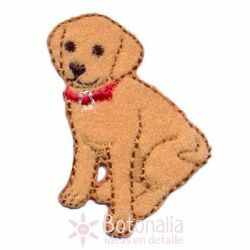 Product Description: Iron-on sticker (patch) with an embroidery of a head of a dog.Content: 1 iron-on sticker.Dimensions: 30 x 45 mm. Max. length: 45 mm.Material: textile. 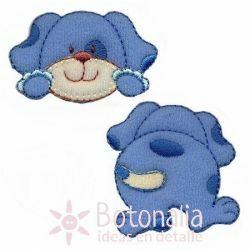 Product Description: Double sticker with an embroidery of a head and back of a dog in blue color.Content: 2 iron-on stickers.Dimensions: 55x35 mm (head) and 45x48 mm (back)Material: Textile. Product Description: Sticker with a design of a white little dogContent: 1 iron-on sticker .Maximum Length: 35 mm.Material: Textile. Product Description: Sticker with a design of a dogContent: 1 iron-on sticker .Maximum Length: 36 mm.Material: Textile. Product Description: Sticker with a design of a little white dog. Content: 1 iron-on sticker. Maximum Length: 45 mm. Material: Textile. Product Description: Sticker with a design of a dalmatian dog head.Content: 1 iron-on sticker .Maximum Length: 80 mm.Material: Textile. 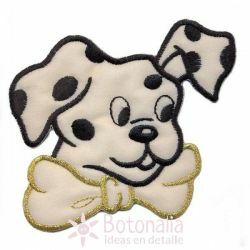 Product Description: Sticker with a design of a dalmatian dog's head.Content: 1 iron-on sticker .Maximum Length: 85 mm.Material: Textile.